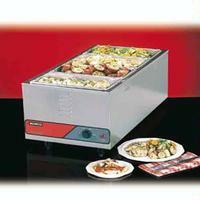 Add side dishes and entrees to existing lines or create entirely new temporary buffet lines quickly and easily with NEMCO’s full-size countertop warmers. You’ll enjoy greater menu flexibility and the ability to respond efficiently to changing menu requirements. Plus the reliable adjustable thermostat helps to ensure that food held in serving lines is always within your food safety temperature guidelines. Unique heating system design provides even heat distribution to prevent “hot spots”. This design provides exceptional heat transfer, even heat distribution and lower preheat time. NEMCO’s warmers also have lower surface temperatures and longer life components than our competitors. Heavy-duty stainless steel well.